Despite the current sad situation of Etisalat, they are still up with their game of retaining their customers. And yet, they have announced another offer called Etisalat Super Bonus Offer (revamp). This is coming after announcing the Welcome Back promo. 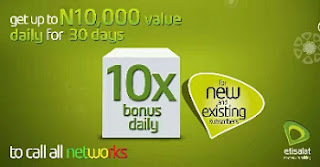 Etisalat Super Bonus offer is a special offer for both old and new subscribers on the Etisalat network. It gives you up to 10 times the value of your first recharge daily. I have been enjoying this offer since it was announced, and it's really cool. You can get up to N10,000 value daily for 30 days to call all networks. This special offer is hashtagged #SBORevamp. For New Customers: You will get 10 times the value of your recharge daily for voice calls and data to all networks in the first month. For Old Customers: You will get 7 times the value of your first recharge daily for voice calls only to all networks for 30days. Note that voice bonus is valid for 7 days and data bonus is valid for 1 day. If you are a new customer, you will also get 7 times the value of your first recharge daily for voice calls only to all networks in the 2nd and 3rd month. This offer is for all customers on the Etisalat network, regardless of your Tariff plan. Is it a continuous offer after 7 days or 30days of another recharge will I get the bonus ? Once the offer is activated, you will keep getting the bonus till 30 days. 😂.. Smart network.. Dey re to stop using the brand name afta 3 weeks..
Ummmmmmmmmmmm. I will try this. Make I screenshot the code. Wow it worked and i got mine. Tnx Kachi for this post.